There’s a great line in the satirical novel “The Restaurant At the End of the Universe,” from author Douglas Adams, about the kind of person who should not be President. Specifically: people who want to be President. “Designated Survivor,” which made its debut on ABC Wednesday night, provides a different scenario: somebody who has no desire to become President suddenly thrust into that role after the Capitol is bombed during the State of the Union, killing the President and everyone in front of him in the line of succession. Kirkman is just a nice guy. Square. Not really an interesting human being. Lacks any kind of real ambition. But I should point out that he’s not a total pushover — he takes great exception to the President excluding all his stuff from the State of the Union speech. On the other hand, when he learns he’s about to be fired, he’s kinda cool with it. Anybody who’s cool with being fired is not the kind of guy who gets elected President. And when Kirkman ends up with the job, he knows he’s not ready. The first thing he does after being dragged into the PEOC, deep underground beneath the White House, is excuse himself so he can find a toilet to puke in. It’s not grief puke. That’s not sadness that’s infecting his gut. It’s the pressure. He didn’t want this. He doesn’t think he can handle it. He’s terrified of ruining everything. The speech writer puking in the next stall (Kal Penn) tells him he should quit. Kirkman himself wants to quit. He won’t quit, obviously, since the whole premise of the show demands he stay in office. But in the show, Kirkman very quickly realizes that he might be the only one who can keep the U.S. from going to war with Iran. If the bombing of the Capitol was one trainwreck, then Kirkman now finds himself at the front of another train that’s about to barrel into the wrecked one. So he decides it’s his duty to stop it. And maybe he can, because being president is not his thing. Because he’s kind of an outsider. He was going to be fired as HUD secretary, after all, because he wasn’t good at playing politics. Maybe that inability to be a politician is exactly what makes him fit to be President. What’s funny about that is Donald Trump’s campaign ads and his army of supporters say the same thing about him. He’s an outsider, ready to clean up the government. He tells it like it is instead of playing politics. But there’s a big difference between Kirkman and Trump. For one, it’s hard to imagine President Trump turning down an opportunity to bomb Iran — whereas turning down an opportunity to bomb Iran, during an unprecedented national crisis, is President Kirkman’s first act in office. 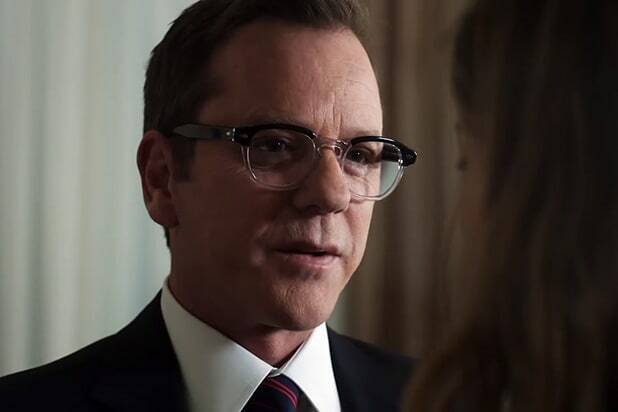 “Designated Survivor” is positioning Kirkman as a new sort of Jefferson Smith, from “Mr. Smith Goes to Washington,” while the best analogue for Trump in that movie would be the villain. As that comparison would suggest, Kirkman is a TV President made of TV President tropes. Right now, that might be exactly what we need — an American figure who when thrust into the biggest and brightest spotlight in the world doesn’t revel in it. He’s calm, and thinks things through. He’s ready to head in the direction his well calibrated moral compass is pointing, even while it puts him in jeopardy with those who disagree with his decisions. He wants to do what’s right, and what he thinks is right doesn’t involve killing people from other countries for no reason. Kirkman comes off in the pilot episode as an exemplar of American ideals — ideals that are so often preached by racists and xenophobes who don’t actually believe in liberty or due process or the concept that every person is created equal and that they all deserve the same rights and opportunities as everyone else. I grew up in Alabama, okay, so I’ve seen a lot of that brand of hypocrisy in my life. And we’ve all seen it this year every time Trump stands in front of a camera. Through one episode, President Kirkman has been thus far positioned very sincerely as Not One Of Those People. And if we ever needed that on our screens, it’s right now. Let’s hope “Designated Survivor” can keep it up.